While Wiki Education spends a great deal of time traveling to conferences and universities around the country, it’s not often that we have the chance to host participants in our program at our San Francisco office. On July 31, we had the pleasure of welcoming Naniette Coleman, an instructor in our program from UC Berkeley, her student Angela Zeng, and Berkeley librarian Corliss Lee to our home base. 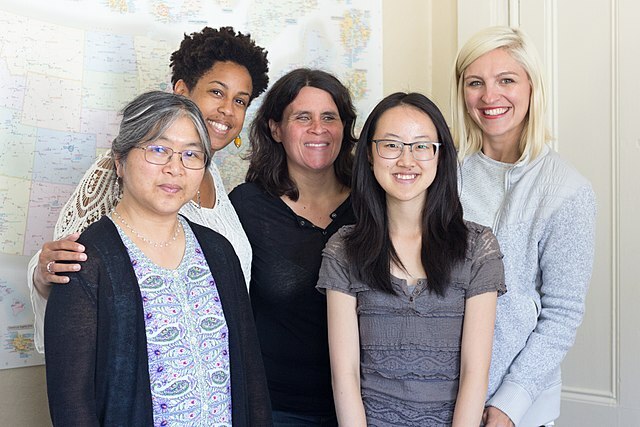 From left to right, UC Berkeley Librarian Corliss Lee, UC Berkeley professor Naniette Coleman, Wiki Education Classroom Program Manager Helaine Blumenthal, UC Berkeley student Angela Zeng, and Wiki Education Outreach Manager Samantha Weald at the Wiki Education offices. Unlike most of our instructors who run their Wikipedia assignments on a term by term basis, Naniette is in the unique position of working with her students on their Wikipedia projects over the course of several terms. In Spring 2017, she began the Student Working Group on Privacy Literacy as part of the Coleman Lab. Naniette’s students are composed of undergraduates from a variety of majors, ranging from African American Studies to Statistics to Sociology. What binds them together is a common interest in issues of privacy and how those relate to a host of different fields. During their visit, Naniette and Angela presented on several key initiatives stemming from their Wikipedia work. As part of their ongoing project, the students created a video about the nature and impact of their Wikipedia contributions that we hope to share in the near future. They also presented a “Wikipedia Cheat Sheet” that the group has collectively been working on to aid one another as well as future participants in the Coleman Lab. During the session, we exchanged a host of ideas, but we were most excited to learn about Angela’s contributions to the page on Privacy in education. We discussed how Angela could make the page more discoverable, but more importantly, we got to see how proud she was of her contributions. Though we work with thousands of students each term, we rarely get to interact with them directly. Hearing about Angela’s experience as well as those of her classmates underscored the true value of a Wikipedia-based assignment. As part of their visit, I also had the chance to discuss how Berkeley’s vast network of librarians can better assist with Wikipedia assignments. Going forward, I’ll be working closely with Corliss to guide Wiki Education’s relationship with Berkeley’s library and to develop resources that will help students undertaking Wikipedia projects at Berkeley. Thank you again to Naniette, Angela, and Corliss for taking the time to visit us and discuss the incredible work you’re all doing.